Here at Lightning Bolt we have a vast inventory of concrete anchors. One type of concrete anchor that is commonly used is the concrete Wedge Anchor. They come in a variety of materials thus 304 stainless steel wedge anchors & 316 stainless steel wedge anchors are considered stock items. Our pricing is among the very best in the industry. Wedge anchors prove to be an excellent fastener for firmly securing fixtures into concrete. Determining the correct length and diameter of wedge anchor to use is key. To determine the length, you must consider three main factors, the first of which being the thickness of the object you are fastening. Using that thickness, then account for the space that the nut and washer require + the minimum embedment that should be used based on the diameter of the anchor. This minimum embedment is the depth that the anchor must be installed at after the expansion of the concrete. The diameter of the wedge anchor must be less than that of the hole it is being used in. For example, if you have a 7/8” hole, the anchor will be usually slightly less than 7/8”. Make sure to adhere by engineering specifications if they are available. Wedge anchors are available in many types of finishes and material grades. The four most common types are: zinc plated low grade carbon steel, hot dipped galvanized, 304 stainless steel, and 316 stainless steel. For dry and mostly indoor applications, zinc plated carbon steel wedge anchors perform well. If, however, you are using the anchors on a high moisture outdoor project, hot dipped galvanized or 304 stainless steel wedge anchors are recommended. 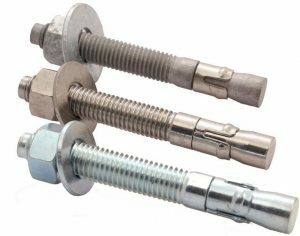 316 stainless steel anchors are more commonly used in highly corrosive or acidic environments, as they perform very well against such extreme elements. A typical package of our anchors comes complete with nuts and washers. Here in our Baton Rouge warehouse, we stock a large amount each of these types of wedge anchors, and deliver them to jobsites nationwide efficiently and on time.